While on my Hospice visit yesterday afternoon the receptionist and I struck up a beautiful conversation on the power we have through Christ. We not only have power, but by Christ dying on the cross, He vested us with power AND authority. The devil only has power and the only way he has power over us is if we LET him. Why in the world would we do that? When and if we do give him power over our circumstances, over our self view, our self worth, our self esteem, over our disease or future it’s because we are willfully choosing to NOT believe the truth as it is written in scripture. I’ve heard it quoted that there are over 7,000 promises in scripture. I don’t know about you l, but I love that number. God created His Son in His image and sent Him to us to die for our sins so that we may have eternal life. Now that’s true, uninhibited, unconditional love! Why would God do that if He didn’t absolutely love and adore, think we are perfect, more precious than rubies, beautifully, wonderfully made and want the very best for us? I’m sure you’ve had a conversation or two with a friend, a coworker, a family member when they were down on themselves, speaking negatively about themselves or about their life, abilities, intelligence and so on. Maybe the conversations are with yourself (or is that just me?). It’s uncomfortable, disheartening and downright painful right? We would do anything to help convince them that the opposite is true. How much more does God painfully desires us to see ourselves as HE sees us. God created us in His own image. How do we do effective battle with our mind and our thoughts? The only way to get rid of a thought is to replace it with another thought. Pastor Jimmy Evans has preached on this very concept and it’s proven. I’ve proven it in my own life, in my own head with my own negative or even neutral thoughts. When my thoughts turn negative, or anything less than positive I capture the positive and keep repeating. At least that’s what I try to do. I find the scriptures that pour into my Spirit, that I know by heart and that soothe my soul and it click “repeat”, “unending repeat” some days. 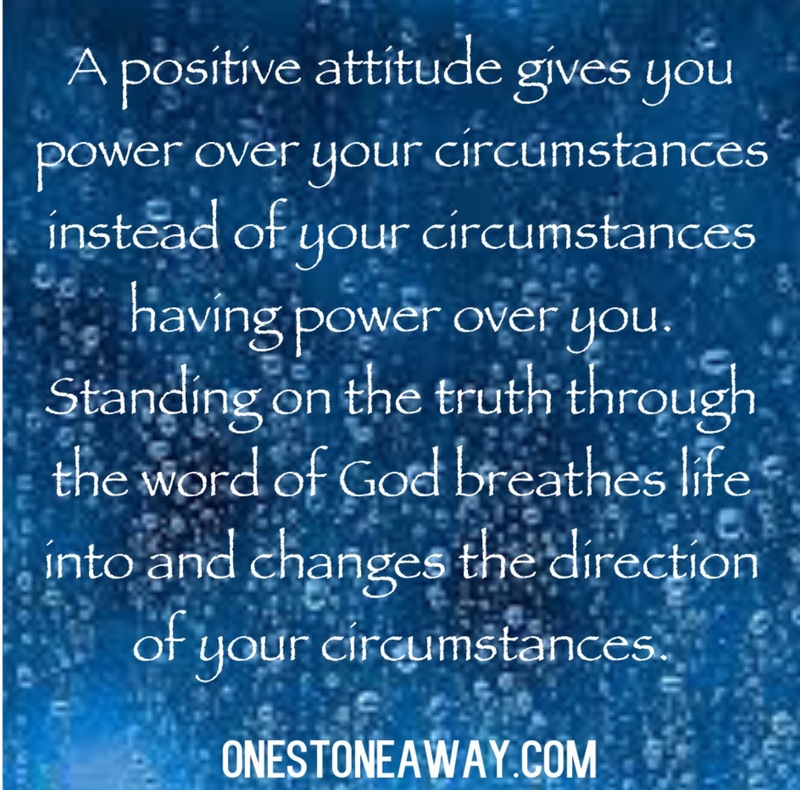 A positive attitude gives you power over your circumstances instead of your circumstances having power over you. Standing on the truth through the word of God breathes life into and changes the direction of your circumstances. It’s when you truly believe and when you know, that you know, that you know the Word of God is the only truth, the only way, the only life that your perspective will shift in perfect alignment just as God intended. A very well known, probably one of the most well known scriptures contains two promises. Using a football term it’s a “playbook” if you will of the mission Satan has for us and the antidote our King has spoken in response to the fallen one and has spoken life over us. Most of us truly don’t realize we hold the power over our thoughts which affect our circumstances or our attitude in, by and through our circumstances. God can’t tell us what to think. Satan can’t tell us what to think. Our friends, family, coworkers cant tell us what to think. We choose to believe whether it be good, bad, indifferent. Now for some of us this life isn’t going to be easy. I know, I’ve walked through cancer, divorce, death, but there is hope and it’s in the Name of Jesus. We have a race to finish. Jesus has set us up to win the eternal win. If you’re too weak to run, if you’re too weak to even stand, fall into the arms of Jesus and rest on His promises for your life. He desires to spoil you beyond all you can ask or imagine.